The 5520A-525A/LEADS are professional-quality lead sets that ensure you always have the right probes and connectors for the job at hand. These top quality leads provide years of service and are designed to minimize connection loss and thermal effects. Each test lead has silicon insulation for easy handling and is rated at 1000V. 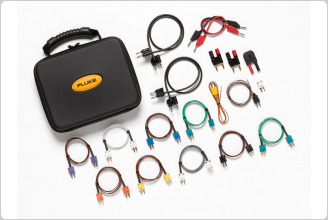 In addition to the test leads, each Fluke Calibration lead set contains a full set of thermocouple extension wires with mini-thermocouple connectors on each end for fast, trouble-free calibration of thermocouple instruments. 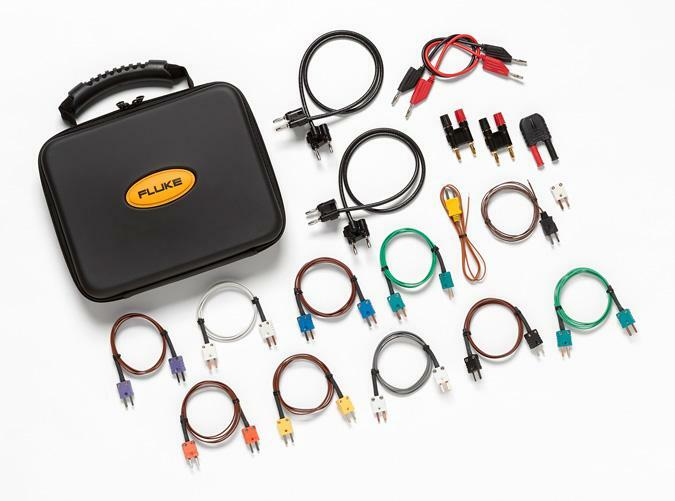 Each Fluke Calibration lead set comes with a soft carrying pouch for convenient transporting and storage. This lead set is ideally suited for the 5522A Multi-Product Calibrator. It includes all thermocouple type extensions used on the 5522A, terminated with male-to-male mini-connectors on both ends for easy calibration hookups. This lead set is also suitable for the 525B and 7526A Temperature/Pressure Calibrators and the earlier 5520A Multi-Product Calibrators.